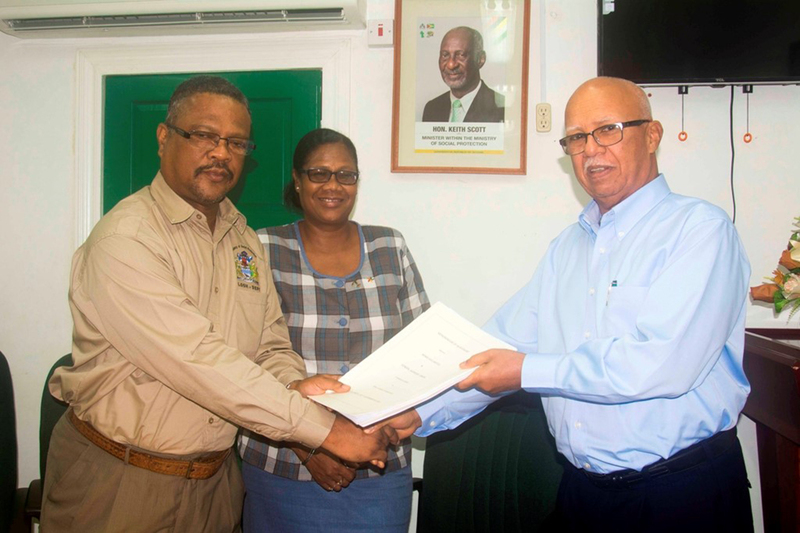 Banks DIH Limited and the General Workers’ Union signed a new three-year agreement on Wednesday in the presence of Charles Ogle, Chief Labour Officer in the boardroom of the Ministry of Social Protection on Brickdam, a release from the company said. The three-year Memorandum of Agreement will cover the period 1st October, 2017 to 30th September, 2020 in relation to salaries and other Conditions of Employment for the unionised employees of the company. The employees will enjoy an increase of 7% for the first year of the new contract and 4% and 2% for the subsequent years. The agreement also included increases in allowances. Signing on behalf of the company were Chairman/Managing Director Clifford B. Reis and the Human Resources Director Andrew Carto. Signing on behalf of Ministry was Ogle. Signatories for the GWU included the General President Norris Witter, General Secretary Pancham Singh, and Senior Vice-President Quincy Bailey.